Harsh sentences have been thrown at labour activists in Iran following recent class struggle and repression. Sousan Razani and Shiva Kheirabadi, sentanced to 15 lashes and 3 months in jail apiece. 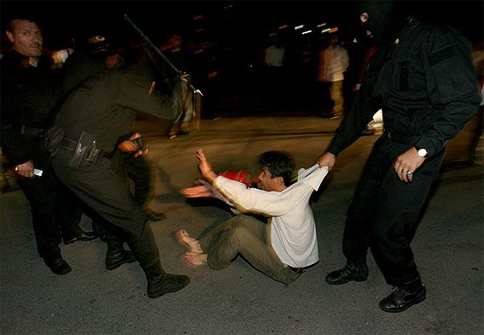 Housseni, Khani, Razani and Kheirabadi were prosecuted in connection with an illegal May Day demonstration in Sanandaj, the capital of Iranian Kurdistan, whilst Khaled Housseini was charged as a result of his attempts to aid imprisoned labour activist Mahmoud Salehi. A teacher, Farzad Kamangar, has also been sentenced to death for allegations related to involvement with Kurdish nationalist terrorism. It is understood that he has been tortured extensively whilst detained. Meanwhile, another labour activist, Afshim Shams, languishes in custody awaiting sentancing. Shams is a member of The Coordinating Committee to Help Form Workers’ Organizations, and The Committee in Defense of Mahmoud Salehi. Whilst labour unions are theoretically legal in Iran, the Iranian ruling class has attacked attempts to form independent, grassroots workers organisations. A corporatist labour organisation, The Workers' House, is the main mediating body between capital and labour, and whilst it occasionally challenges governmental decisions, it is well understood to be tool against workers. Also in Iran, the ongoing struggle by Bus Drivers in Tehran to form an independent organisation has resulted in a recent dismissal verdict against 9 members of the bus workers syndicate. The leader of the syndicate, Mansoor Osanloo, was sentenced to five years imprisonment last year. For a roundup of recent class struggle in Iran, see here.